Los Angeles pedestrian accidents in intersections happen with all too much frequency. In fact, our local public radio station, KPCC, recently conducted a survey of pedestrians in L.A. and polled city officials to determine which intersections in the “City of Angels” pose the greatest risk to persons attempting to cross on foot. They came up with this interactive map which details the 53 Most Dangerous Intersections in Los Angeles. Not surprisingly, the majority of these crossways are in the dense urban areas of Santa Monica, Hollywood and Downtown L.A. However, there were also some pockets of dangerous roadway crossings in suburban areas like the Van Nuys region of the San Fernando Valley. 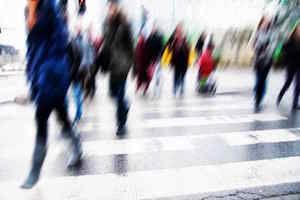 What are the Most Common Causes of Pedestrian Accidents in Urban Areas Like Los Angeles? Failing to Come to A Complete Stop At The Limit Line: California Vehicle Code 22450(a) mandates as follows: “The driver of any vehicle approaching a stop sign at the entrance to, or within, an intersection shall stop at a limit line, if marked, otherwise before entering the crosswalk on the near side of the intersection.” Oftentimes, drivers are attempting to beat the light or are doing a “California stop” (i.e. roll through) in preparation for turning right on a red light or at a stop sign. If pedestrians enter the crosswalk and the driver is approaching in the far right lane, this can spell disaster. Running Red Lights: We all know that “RED MEANS STOP” but, to be reminded of the obvious, the California Vehicle Code states as follows:”21453. (a) A driver facing a steady circular red signal alone shall stop at a marked limit line, but if none, before entering the crosswalk on the near side of the intersection or, if none, then before entering the intersection, and shall remain stopped until an indication to proceed is shown, except as provided in subdivision (b). Los Angeles is like any other highly trafficked urban environment. Drivers are constantly in a hurry to get from point A to point B and blowing through intersections is an all too common occurrence. While there is a split second delay between when the light turns red and the walk signal at a crosswalk shows on, this is sometimes not sufficient for impatient drivers who run stale reds. Making Left Hand Turns Against Oncoming Traffic and Across A Crosswalk: C.V.C. 21801 requires that no vehicle attempt to make a left hand turn until the vehicle approaching from the opposite direction are a sufficient enough distance away so as to not constitute a hazard. The problem with Los Angeles intersections is that far too few have left hand green arrow signals. Most intersections in L.A. require the driver to “wait it out” in the middle of the junction at a steady green signal, which turns to yellow and sometimes red before you can hang the left. If pedestrians are crossing where the left hand turn needs to be made, haste in whipping the left can result in a tragic and sometimes fatal collision between car and walker. Why is it Important to Consult and Retain Legal Counsel Following an Auto v. Pedestrian Mishap? Unfortunately, it is human nature to deny responsibility for incidents which result in potential legal liability. For every provision of the Cal. Veh. Code like 21950(a), which states: “The driver of a vehicle shall yield the right-of-way to a pedestrian crossing the roadway within any marked crosswalk or within any unmarked crosswalk at an intersection”, there is an equal provision like CVC 21950(b) that mandates that pedestrians have a “duty of due care” to guard their own safety. This makes it crucial to retain an advocate that can garner evidence to argue for culpability on the part of the driver that strikes the person on foot. If the driver is insured, his insurance company will immediately assign a claims adjuster and will employ investigators to obtain recorded statements and other evidence that may support a theory that injured wayfarer was not looking where they were going before they entered the crosswalk when, in fact, in most instances, the law can and should protect people traversing our city streets on two feet. A quality personal injury attorney familiar with Los Angeles and its dangerous intersections is able to reconstruct accidents in a way most beneficial to the pedestrian.